Although my chief task was teaching in St John’s Regional Seminary, I helped found a pastoral planning body that coordinated the Church’s new projects in all dioceses of Andhra Pradesh. It was known as Jyotirmai. Jyotirmai submitted each year an overall plan to 5 European aid agencies. This programme benefited especially the small villages where new converts joined. It resulted in thousands of small prayer huts being built, catechists provided with a buffalo or sowing machine, grants for children to get an education in small boarding schools. Read my biography for more details. See the picture gallery here. 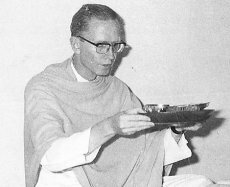 While I worked in St John’s Regional Seminary in Ramantapur near Hyderabad, I founded a Communication Centre – Amruthavani – that provided services for all the eight dioceses of Andhra Pradesh. We ran correspondence courses, prepared radio programmes, developed slides for catechetics and printed books and pamphlets. The language we used in all this was Telugu. 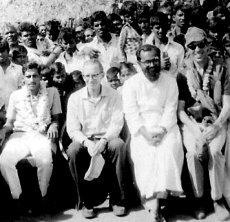 I publish here a precious collection of b&w pictures of all staff members at Amruthavani when I took leave of it in 1976 because I had been elected Vicar General of the Mill Hill Missionaries.